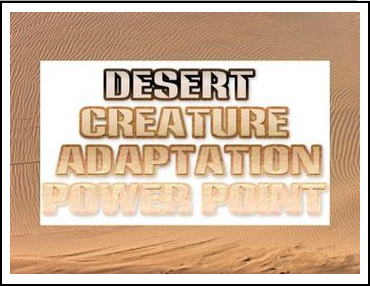 This 24 slide power point of Desert Adaptations illustrates adaptations in behavior (being nocturnal, burrowing for shelter) and structure (such as camouflage, sharp talons, sharp spines, long roots) that God provided desert creatures. Discusses predator/prey and the definition of a desert with links to the dietary regulations given in Leviticus 11 to the Children of Israel. Illustrated throughout. Aligns with VA SOL’s 3.4, 3.5, 3.6, 4.5. If you enjoy this or other free resources I offer, please take a moment and give them a positive rating. ← Halloween Craftivity Don’t Pick Me!